It looks as though that in about three to four billion years, we'll need a new revised, Hitchhiker's Guide to Galaxy. According to recent research the Andromeda Galaxy may be destined to collide with the Milky Way. Right now, the Andromeda Galaxy is barreling toward the Milky Way at 100 to 140 kilometers per second. It’s expected to collide with the Milky Way in about 3.75 billion years. Our solar system should survive the cataclysm — space is mostly space, so we won’t collide with other stars, and our sun isn’t supposed to turn into a red giant and consume the Earth until about 5 billion years from now. But we could also be flung away into space to become a rogue star system, our former galaxy fading into the distance. Either way, our night sky will be completely changed. Observers on Earth would see an incredible show. 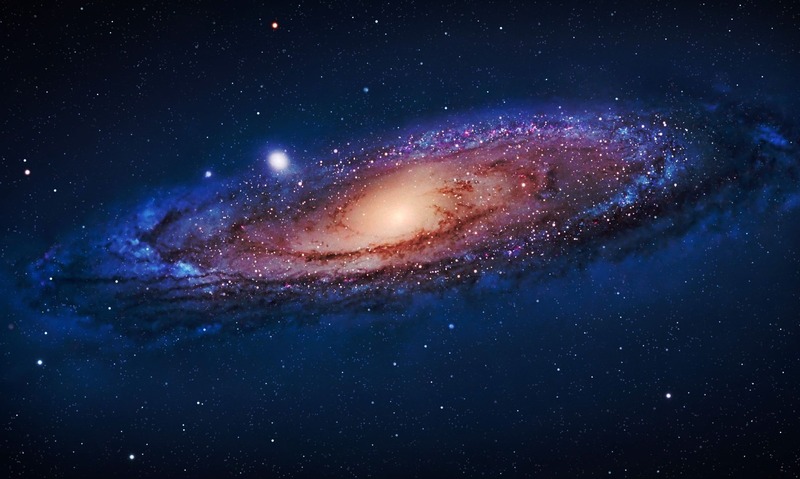 observations by the Spitzer Space Telescope revealed that Andromeda contains one trillion stars, greatly exceeding the four billion stars in our own galaxy. This is a fluid-dynamics artist’s rendering of what it’ll look like to a distant observer when the Andromeda galaxy and the Milky Way collide in just under 4 billion years.